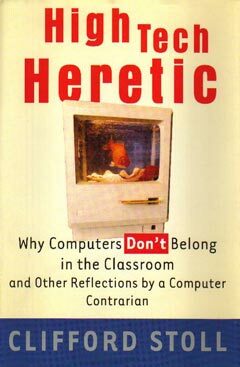 Clifford Stoll is the author of High-Tech Heretic: Why Computers Don't Belong in the Classroom and Other Reflections by a Computer Contrarian. Stoll argues that computers give students' information, but don't help them learn. 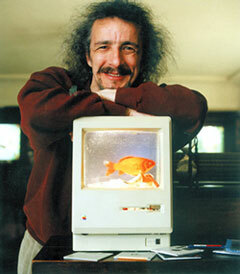 Clifford Stoll: Part of the premise. EW: A good part of your book focuses on the idea that computers don't belong in classrooms. Education World is a Web site that, among other things, helps teachers integrate computers into their curriculum. I'm interested in why you think we shouldn't be doing that. Stoll: Your teachers believe in using computers in the classroom? EW: Many of them. Others are required to use computers in their classrooms, and they want to do it in the best way possible. Stoll: What about the old-line teachers who don't want to use computers, who are being pushed aside and marginalized because of the techno-hucksters' view of what should go on in classrooms? EW: Teachers are charged with preparing students for the future. Don't students need to learn how to use computers? Stoll: In my visits to schools, I don't find children who are ill at ease behind a computer screen. I do find lots of kids who cannot read analytically, who do not read books, who cannot write legibly, who cannot assemble a 250-word essay. But I do not see many kids who can't use a computer. Do you think children don't have enough exposure to electronic messages? Children have too much exposure to electronic messages. Is the problem that they don't watch enough TV? That they don't get enough media? The problem is that they get too much media already! ... If I ask a student to tell me about Huckleberry Finn, I want that student to read the book. If he simply goes to the computer and finds information about Huckleberry Finn, what has he learned? Computers provide kids with information. They don't help them learn. Stoll: Where did you get your Ph.D.? I got mine honestly. I didn't use Cliffs Notes. EW: In your book, you talk about a student "watching a monarch chrysalis in a field of milkweed." What about the students who might never see a field of milkweed? Can't technology expose children to things they would not ordinarily experience? Stoll: You mean the "city kids who haven't seen a cow" argument? Do you really think those children exist who don't know what a cow looks like? Do you think kids look at a frog on a Budweiser billboard and don't know what it is? Computers cannot provide experiences. Think about the things you've "experienced" on a computer. Then think about the things you've experienced in real life. How do they compare? ... How much does a field trip cost? $100? $200? How much does a computer lab cost? Thousands of dollars? How many field trips can you take for that amount of money? EW: What about those kids in inner city schools who, even if they go on those field trips, will need computer skills to compete in the job market? Stoll: I live very near an inner city school, and I can tell you that the main problem in inner city schools is horrible discipline. In what way is that helped by a large computer budget? Often, computers in inner city schools are wrecked or stolen very quickly anyway. Even if the computers can be secured, the schools cannot. If the computers aren't wrecked by the kids, they're stolen by the neighbors. If the computers themselves aren't stolen, the cables are. In a nearby city high school, only about 5 of 35 computers in the computer lab are working. Educational technologists like to sit in their offices and dream of computers in idealized city schools, but that's not what really happens. EW: In most classrooms, teachers need to work with individual students or with small groups of students. During those times, isn't it more valuable for other students to be working at the computer than to be doing traditional seat work? Stoll: Working on the computer is seat work. The children aren't moving. They aren't doing anything active. They're sitting in their seats. EW: They're doing more than simply filling in information on a work sheet. Stoll: There is no reason for any student to use a work sheet in his or her entire school career. EW: Don't computers have any value, in any classroom? Stoll: It would be bad enough if computers simply didn't add to a child's education. The problem is that the use of computers subtracts from the student-to-teacher contact hours. It directs attention away from the student-teacher relationship and directs it toward the student-computer relationship. It teaches students to focus on getting information rather than on exploring and creating. Which is more interactive -- a student and a teacher or a student and a computer? ... Suppose we wanted to create a nation without social skills? Can you think of a better way to do that than to tell students, "Don't interact with the teacher. Interact with a computer?" Suppose we wanted to create a nation that can't read? Can you think of a better way to do that than to say to students, "Don't get your information from a book. Look it up on the Web?" If we wanted to discourage students from exploration, what better way than to search for answers on a computer? "Suppose we wanted to create a nation that can't read? Can you think of a better way to do that than to say to students, 'Don't get your information from a book. Look it up on the Web?'" EW: So you believe that computer use actually detracts from the educational process? Stoll: There's a cost to bringing computers into a school. And I'm not talking about just the initial costs -- which can be substantial-- or the upkeep -- which can be many times the initial cost. The real cost is what you are not going to be teaching. ... I've talked to a former kindergarten teacher who stopped teaching because the school replaced sandboxes with computers. You can't have sand or dirt or peanut butter and jelly sandwiches in a classroom with computers. I've talked to a second-grade teacher who can't have real magnets in her classroom because they erase the software that goes with the seven computers in her room. So instead she has a software program about magnets, and kids learn about magnets on the computer. Which will help kids learn about magnets better-- real magnets or a computer program that simulates magnets? ... I go into a lot of schools and usually the first thing the principal does is bring me into the computer lab. The first question I always ask is, "What did this room use to be?" Often the answer I get is, "Oh, this was the music room, but we don't teach music anymore," or "This was the art room, but we don't teach much art anymore," or "This used to be the library, but now it's the media center. We keep the books in the closet. If a student wants one, we can probably find it." EW: Problems existed in schools long before computers. Why blame them all on computers? Stoll: The central issue is What problem is solved by bringing computers into the classroom? Do they provide a higher quality of education? Let me tell you what I see as the main problems in public schools, and you tell me how those problems can be solved by computers. Overcrowding: Can that be solved by computers? At the very best, computers have no effect on the problem-- except to make the room more crowded. Hyperkinetic kids: Can they be helped by computers? No! They're only getting more media, more stimulation, more of what caused the problem in the first place. Poor attention toward the teacher: Can directing students' attention toward a computer increase students' attention to the teacher? Poor attitude toward scholastics: Is it "scholastics" to download information from a computer? The one thing that computers do extraordinarily well is bring information to kids. Computers give kids access to vast amounts of information. Stoll: Is a lack of information a problem in schools? I've never once had a teacher say to me "I don't have enough information." Teachers say they don't have enough time. The problem in classrooms is not a lack of information. It's too much information. EW: Where do you think the money that's being spent on technology should be spent? Stoll: The money should be spent on reducing class size, on providing teachers with more prep time, on improving school grounds so that students have the ability to study nature in nature, on providing lessons in the humanities and in other technologies, such as plumbing, woodworking, auto mechanics, home economics. ... Why are there so many pilot projects specific to computers, while so many other things go unfunded? I say this in my book, but I'll say it again. Imagine you have two millionaires and each one is donating $1 million to a local school. The first millionaire says, "You have to spend the money on technology." The second millionaire says, "You can spend the money on whatever you need." Which donation will benefit the kids more? EW: Can't the computer be looked at as just one more tool for teachers? Stoll: Saying the computer is just a tool makes it seem too neutral. It ignores how this tool changes our educational system. I have no doubt that though we're teaching our children how to use computers, we're also teaching them that when you have a problem, the first thing you should do is turn to a computer to solve it. Originally published 05/30/2000; updated 06/09/2005.